Last week, 54-year-old Lillie McCloud (a.k.a Nicole J. McCloud) wowed X Factor judges when she sang "Alabaster Box" by CeCe Winans'. McCloud was first believed to have been an undiscovered talent but, she is an international recording star. Eurweb.com reported that McCloud has performed with musical greats like Stevie Wonder and Michael Jackson. Despite the controversy surrounding her beginnings, I think she sang beautifully. Some souls were saved that day, honey! The songstress was dressed in a tight, black, one-piece suit, and she wore her hair in a big beautiful afro. I know some people were wondering whether it was a wig, but I am not concerned whether it was a wig or not, lol. Also, McCloud was in great shape! I could only hope to look as great as she does at 54-years-old. Rock on, Mrs. McCloud! Check her out below. 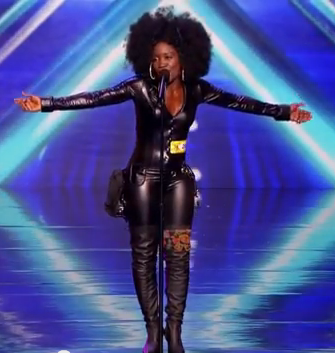 What did you think of Lillie McCloud's style and performance on X Factor?